Lake Como 03 is a spectacular villa dating back the 19th century located in a privileged position on the banks of Lake Como. It was built for the will of an Italian family which wanted to show their grandeur and richness. For this reason the villa presents a sumptuous façade, frescoes and precious ceilings, a stunning atrium with an imposing staircase, chandeliers and opulent furniture. Such a stunning villa is a unique setting for weddings in the Lake Como scenery. Furthermore, this exclusive villa provides a luscious and large park with rare plants and centenary trees and, above all, a spectacular view on Lake Como. The private dock permits the arrival at the venue by boat while enjoying the stunning villa and its surroundings. The terrace in front of the villa is one of the most elegant and romantic setting for weddings on Lake Como. Can you imagine the dreamy atmosphere of getting married on the shores of Lake Como with a fairy tale villa on the backdrop? 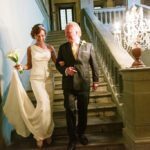 Civil ceremonies with legal binding can be set at Villa Carlotta or Villa del Balbianello (transfers from the ceremony place to the reception venue can be arranged by boat). 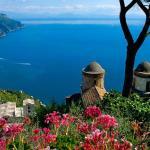 Would you like to know more about wedding ceremonies in Italy? Please read a dedicated post in our blog clicking here. The venue can accommodate up to 450 guests (outside or in different adiacent rooms. The bigger room accommodates 90 guests for a seated dinner. Music is allowed until midnight outside. Afterwards mucic can continue indoor. The villa is open all year. The indoor halls allow to host weddings and events also during winter time. This venue doesn’t provide rooms for the accommodation. One of the most prestigious hotel on Lake Como, Villa D’Este, is located at walking distance from the wedding venue. 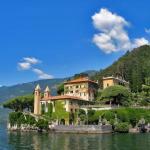 Many other options are available in the area of Cernobbio and Como. Bellissimo wedding planner will provide a continuous assistance for the booking of the rooms and apartments suitable for the bride and groom and guests accommodation. The fee for the hiring of the villa depends on the number of guests. For an estimation, consider the fee for the hiring of the venue from 5pm to 1am is between €10.000 and €14.000 + vat. Upon request, it is possible to extend the time of use of the venue. For the reception, a catering company is hired for the occasion. The price for the menu start at €130 + vat per person. The private pier of the venue allows to arrive directly at the wedding venue and breath its romantic and elegant atmosphere. For an scenic arrival of bride and groom, this exclusive venue provides a heliport suitable for take off and landing of helicopters. The proximity to Como is an important plus of the venue. Indeed Como offers a wide range of accommodation, restaurants, bars and shops. It is also easily reachable from Milan by train. Thanks to its beautiful halls, this venue is the ideal venue also for winter weddings. This venue is the perfect venue for a luxury wedding on Lake Como offering the possibility to take advantage of unique settings both indoor and outdoor. In order to add a special touch to the wedding day, it is possible to arrange a firework show on the water. The display of lights and colours on the water of Lake Como will be an unforgettable experience and lovely surprise for the guests. If you wish to receive additional information and a tailor-made quotation, please contact us clicking at the following link.